The track premiered during the most recent edition of the publisher’s This Week in Marvel podcast. Oddly enough, this actually isn’t Euringer’s inaugural visit to the Marvel Universe. In 2017, James Gunn gave the musician a cameo in Guardians of the Galaxy Vol. 2 as a Ravager named Half-Nut. Aaron is collaborating with artist Russell Dauterman and colorist Matthew Wilson on War of the Realms. The event follows Malekith the Dark Elf in his crusade to conquer the Ten Realms of the World Tree. With only Midgard (Earth) remaining, Malekith launches an assault on the realm that forces the heroes of the Marvel Universe to fend off his army of Frost Giants, Fire Goblins, and other assorted mythical beasties. If Euringer’s sweeping orchestral theme serves as any hint, the epic battle that ensues is going to be one for the ages. Marvel isn’t the first comic book company to commission a soundtrack for one of their publications. As THR notes, DC released an EP companion to their Dark Nights: Metal series in 2017 that featured music by Tyler Bates and Mike Elizondo. Additionally, The Crow creator James O’Barr enlisted his friend John Bergin to compose songs that accompanied a hardcover re-release of his graphic novel in 1994. 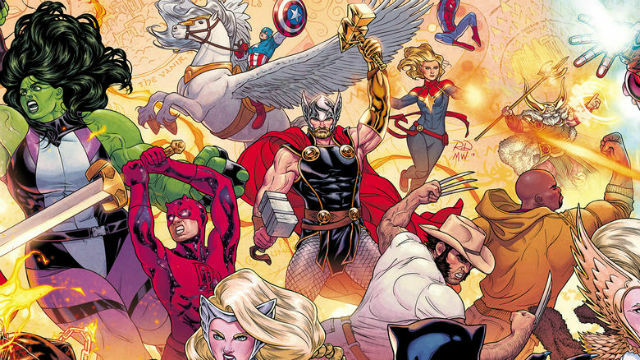 War of the Realms #1 hits comic store shelves on April 3. You can listen to the series’ theme music below, then let us know what you think in the comment section!